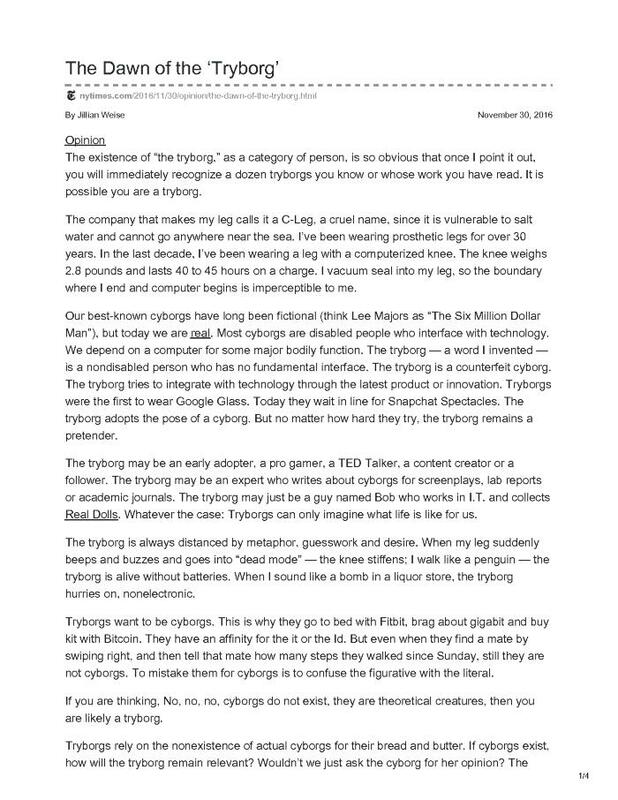 "Tryborgs want to be cyborgs. This is why they go to bed with Fitbit, brag about gigabit and buy kit with Bitcoin. They have an affinity for the it or the Id. But even when they find a mate by swiping right, and then tell that mate how many steps they walked since Sunday, still they are not cyborgs. To mistake them for cyborgs is to confuse the figurative with the literal." "The opinions of cyborgs are conspicuously absent from the expert panels, the tech leadership conferences and the advisory boards. The erasure is not news to us. We have been deleted for centuries, and in the movies, you will often see us go on a long, fruitful journey, only to delete ourselves in the end." "It [the C-Leg prosthetic] gives me the muscular calf of a man-cyclist. I have a ruler, and the company name, on my shin. I can choose between the colors Volcano Shadow or Desert Pearl, which is to say, gray or brownish-gray. I cannot choose a female option because there are none. I have no complaint about androgyny. But I’m just a regular femme who likes to show her legs."